The 1985 FIA Formula One World Championship was the 39th season of FIA Formula One motor racing. It featured the 1985 Formula One World Championship for Drivers and the 1985 Formula One World Championship for Manufacturers, both of which commenced on 7 April and ended on 3 November after sixteen races. The World Championship for Drivers was won by Alain Prost, and the World Championship for Manufacturers was won by McLaren for the second consecutive year. Alain Prost (pictured in 1984) won the first of his four Drivers' Championships by a 23-point margin. The 1985 Formula One season saw continued success for the McLaren-TAG team. After losing the Drivers' Championship by two points to Nelson Piquet in 1983, and by just half a point the previous year to teammate Niki Lauda, Alain Prost would ultimately secure his first of four titles by a 23-point margin. 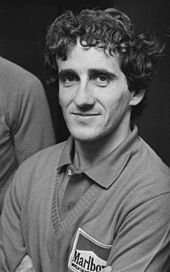 The Formula One writer Koen Vergeer remarked that "It was about time, everyone knew he was the best", reflecting a general feeling that Prost had been unlucky to finish runner-up in the previous two years, even though he had won more races than Piquet in 1983 and Lauda in 1984. The reigning Drivers' Champion Lauda competed in his final season of Formula One, but he was unable to match Prost for results; despite maintaining a close pace with his teammate, Lauda only won once at Zandvoort. Seated next to an unhappy McLaren team boss, Ron Dennis, who had unsuccessfully tried to persuade him to continue driving, Lauda announced his decision to retire for good at the season's end in a press conference before practice for his home Grand Prix in Austria. For most of the season, the points table was headed by Ferrari's Michele Alboreto, who enjoyed his best season in F1. He won the Canadian and German Grands Prix, and was on the podium eight times. However, Ferrari's results faded badly in the second half of the season as other emerging drivers took the fight to Prost. Among these were Ayrton Senna and Nigel Mansell, both of whom scored their first victories in 1985. Lotus team manager Peter Warr had replaced Mansell with Senna going into the season, a decision which seemed justified when Senna took a superb win in the wet in Portugal in Round 2. Despite only scoring a mere 7 championship points up until Round 13 in Belgium, Mansell fought back the Williams-Honda, and chalked up two victories near the season's end, including his famous breakthrough win in the European Grand Prix at Brands Hatch. In winning at Brands Hatch, Mansell made Peter Warr eat his words as the Lotus boss had declared that Mansell would "never win a Grand Prix as long as I have a hole in my arse" after he crashed his Lotus 95T out of the lead in the wet 1984 Monaco Grand Prix. Mansell, now knowing that he had not only the ability but also the car he needed in order to win races, would go on to mount a serious title challenge in 1986. Perhaps the fastest combination of the year was Mansell's teammate Keke Rosberg in the other Williams, who used the powerful Honda engine to set a new lap record around Silverstone in qualifying for the British Grand Prix and becoming the first man to lap at an average speed of more than 160 mph (257 km/h). He finished third in the standings after wins on the street circuits of Detroit and Adelaide, but he lacked the reliability to overcome Prost. 1.5-litre turbocharged engines had become universal during 1985, heralding the extinction of the 3.0-litre naturally aspirated Ford Cosworth DFY engine. Between 1985 and 1986, Formula One engines would achieve the highest levels of power ever seen in the sport. The specially-built Renault qualifying engine reportedly put out more than 1,150 bhp (858 kW; 1,166 PS) by the end of 1985, before serious restrictions and their 'phasing out' began in 1987. The power output of the engines was controlled in racing conditions by means of a strict fuel limit; however, in qualifying trim teams were commonly able to increase the boost of their engines for optimum power while the use of special qualifying tyres also saw speeds increase. This fuel economy was key to successful race strategy in 1985; Nigel Mansell recalled the added interest of planning his fuel use in his autobiography. It also proved costly for Ayrton Senna, who lost victory just four laps from home at Imola when he ran out of fuel. After Prost was disqualified for an underweight McLaren (2 kg), victory fell to Senna's Lotus teammate Elio de Angelis in what would prove to be his second and last Grand Prix win. Michelin retired from Formula One for the 1985 season, leaving Goodyear and Pirelli as tyre suppliers. The top four teams in the Constructors' Championship used Goodyear tyres. 1985 also saw a return to the calendar of the Spa-Francorchamps circuit in Belgium after the Belgian Grand Prix had been held there in 1983 and at the unpopular Zolder in 1984. Although shortened from its dangerous 1947–1970 14 km form, it remained a challenge for the drivers who universally liked it despite the circuit now being only 7 km long, it remained a fast, flowing circuit in the true Spa tradition. It also caused one of the few cancellations of Grands Prix in the sport's history, when the new all-weather track surface laid down in the months before the race melted during the summer conditions in practice. The race was originally scheduled between Monaco and Canada, and extensive repairs were needed and the race was rescheduled for later in the year; on a semi-wet track, Senna was the winner, with Prost finishing on the podium again to take a big step towards his first championship. The Dutch Grand Prix was the last Grand Prix for German driver Stefan Bellof, who later died in the World Endurance Championship race at Spa at the high speed Eau Rouge corner. Bellof had won the 1984 World Endurance Championship driving for the factory Rothmans-Porsche team, but decided against driving for the factory in 1985 to concentrate on Formula One. He did however still drive in various WEC races for the private Brun team in a Porsche 956. Until his death, Bellof was considered one of the rising stars in racing and was rumored to have an offer to drive for Ferrari in 1986. The summer of 1985 was remembered as the saddest weeks for German motor sport, as both German Formula One drivers, Bellof and Manfred Winkelhock died within three weeks in WEC races. Winkelhock, who drove for the Skoal Bandit Formula 1 Team, died at Mosport Park in Canada when his Kremer Racing Porsche 962C crashed head on into the turn 2 wall at high speed. His co-driver for that race had been Brabham's Marc Surer. The Australian Grand Prix, which was one of the world's oldest Grands Prix having first run in 1928, was added to the Formula One World Championship for the first time in 1985. The race was held in Adelaide, South Australia on a street circuit on 3 November as the last race of the season. The Adelaide Street Circuit was praised by the Formula One fraternity, most of whom arrived down under fully expecting another bad street circuit like Las Vegas, Detroit and Dallas, but instead found a fast, open circuit with a 900-metre long straight where the faster cars reached over 200 mph (322 km/h). The 50th running of the Australian Grand Prix won the Formula One Promotional Trophy for Race Promoter as the best race meeting of the year. FOCA boss and Brabham team owner Bernie Ecclestone shocked a press conference when he declared that he believed that the standard of the organisation and the circuit itself was bad news for Formula One. He then explained to the shocked media that Adelaide had raised the standards of what would be expected in the future and that several tracks in Europe already on the calendar, or hoping to be, would have to lift their own games in order to match it. The 1985 season is widely considered by the F1 community to be one of the best and most exciting Formula One seasons of all time. In a season full of excitement, it was the first and last of many things. The 1985 season was affirmation that Senna was one of the best drivers in the world in only his second season of Formula One. It was the first championship win out of four for Prost, the first two race wins (out of 31) for Mansell, and the first two race wins (out of 41) for Senna. The season also enhanced Keke Rosberg's reputation as a "street fighter". Of the 1982 World Champion's five career wins, the last four had been on the streets of Monaco (1983), Dallas and Detroit (1984) and Adelaide (his only other win, his first ever, came at the Dijon-Prenois in 1982). Rosberg's win in Adelaide was his final race for Williams as he was moving to McLaren in 1986 for what would be his final season in F1, and would prove to be the final win of his career. This season was also the last full season for Alfa Romeo as a factory effort (although the team was actually run by EuroRacing on behalf of Alfa Romeo, and had been since the beginning of 1982). It was also the last for Renault as a factory effort until 2002, and the last to include a Dutch Grand Prix, which was the last ever Formula One race at Zandvoort. It also saw the last race at the original Kyalami circuit, and the last South African Grand Prix until 1992 due to political pressure over South Africa's controversial Apartheid laws. 1985 Also saw the last race at the full Paul Ricard Circuit with its 1.8 km long Mistral Straight, the longest straight on the calendar, with the much shorter "Club" version of the circuit used from 1986 following the tragic death of Elio de Angelis in a testing accident. It was the last European Grand Prix to be held at Brands Hatch, the last race with Monaco's infamous dog leg corner and the last British Grand Prix at Silverstone with the Woodcote chicane, and the permanent addition of the Spa-Francorchamps as the venue for the Belgian Grand Prix, and the last win of 25 for Niki Lauda in his final season in Formula One. Even though Formula One had tragically lost rising stars Stefan Bellof and Manfred Winkelhock in separate World Endurance Championship races, it was still a season to remember. The first race of the season was the Brazilian Grand Prix in April, at the Autodromo De Jacarepagua in Rio de Janeiro; the very tough circuit being overlooked by the spectacular Sugarloaf Mountains. Italian Michele Alboreto took pole in his Ferrari ahead of Keke Rosberg in a Williams-Honda and the two Lotuses of Brazilian Ayrton Senna and Italian Elio de Angelis. The oppressively hot and humid tropical weather, combined with the Rio-located track's abrasive surface and banked corners took its toll on the drivers and cars. Rosberg fell out with turbo failure, and McLaren-TAG/Porsche driver Alain Prost took 2nd after taking advantage of an accident involving Briton Nigel Mansell at the start. Prost chased Alboreto during the first half, unable to pass because of the Ferrari's superior straight-line speed. But on the pit straight, Alboreto missed a gear, Prost pounced on this mistake and took the lead from Alboreto, which he kept until the end, followed by Alboreto and Elio de Angelis. The 4½-month-long European tour started with the news that Ferrari driver René Arnoux had been sacked the team, and was replaced by Swede Stefan Johansson (no official explanation has ever been given by either Ferrari or Arnoux). The next race took place in another Portuguese-speaking country, the language's country of origin – Portugal. This race was held at the Estoril Circuit near the capital of Lisbon. Although the practice sessions were held in pleasant weather, it rained heavily for the race. Conditions were extremely difficult, and it saw Ayrton Senna display his mastery of wet-weather conditions. The Brazilian led the race from start to finish, and by the time he had finished, he had lapped everyone except 2nd-placed Alboreto. It was Senna's first victory – which was already very impressive considering the appalling conditions that caused drivers including Prost to aquaplane off the circuit. The first of 2 Italian races held at the fast Autodromo Dino Ferrari near Bologna was an incredibly exciting race. Ayrton Senna took pole again, and led until the final laps when his car ran out of fuel, and the lead was taken by Stefan Johansson – who had started 15th and had dropped to 17th. On a circuit that was definitely the toughest test of fuel consumption of the year, Johansson too ran out of fuel after an electronics failure. Prost then took the lead, and he too just barely made it over the start finish line after having run out of fuel. Although Prost crossed the line first, he was disqualified for his car being underweight, and victory was handed to Elio de Angelis driving a Lotus-Renault. The Monaco Grand Prix was originally supposed to be cancelled due to political wrangling, but it took place as scheduled. After pole-sitter Senna went out with engine problems, Alboreto took the lead, followed by Prost. Alboreto then slid on some oil at the first corner which had been dropped from the gearbox of Italian Riccardo Patrese's Alfa Romeo after it crashed there along with Brazilian Nelson Piquet's Brabham-BMW. Prost took the lead after Alboreto's slip-up, but the Italian took the lead again from the Frenchman at the same place where he had gone off. However, another accident involving Patrese and Piquet caused more problems: Alboreto then punctured a tire, came into the pits to get his tires changed, dropping to 4th place behind Prost, and Italians de Angelis and Andrea de Cesaris. He passed his fellow countrymen, but was not able to catch Prost, who won ahead of him and de Angelis. There was a 4-week gap between the Monaco and Canadian GP's as the Belgian Grand Prix at Spa-Francorchamps was postponed after the newly-laid track surface, to help deal with wet weather melted under weather that was actually hot there. The drivers found it impossible to race with such a dreadful surface, so the Belgian GP would be held in September. The drivers hopped over to the other side of the Atlantic to do a 2-round North American tour. The Canadian Grand Prix at the Circuit Gilles Villeneuve in Montreal produced a Ferrari 1–2, with Alboreto and Johansson taking top honors in that order, ahead of Prost. It was Ferrari's first 1–2 since the 1983 Dutch Grand Prix and their last until the 1987 Australian Grand Prix. The slowest and toughest race of the year was in the United States, at the angular Renaissance Center street circuit in the center of downtown Detroit, Michigan. This race was known to be more of an endurance race rather than a sprint, making it unique amongst the other Grands Prix. Ayrton Senna took pole, 1.2 seconds ahead of the next fastest qualifier, Nigel Mansell. The nimble Lotus proved to be well-suited to slow tracks; and Senna decided to take a chance by using harder tires than the rest of the field and try to go a greater distance. Keke Rosberg passed Prost, Mansell and Senna to take the lead – a lead he kept from start to finish on a circuit that, under the intense heat and humidity, broke up and made half the field retire – which was actually far less than usual at Detroit, which was a real car-breaking circuit. What was even more amazing was that Prost, Mansell and Senna (in that order) all crashed at the same corner at Atwater and St. Antoine Streets. Behind Rosberg were the two Ferraris of Johansson and Alboreto, the former pushing Rosberg hard for the lead. F1 returned to Europe to start the 2nd European tour – made up almost entirely of fast circuits. The French Grand Prix at the very fast Circuit Paul Ricard with its long 1.1 mile Mistral Straight came after the North American tour – where pole-sitter Keke Rosberg averaged more than 140 mph in qualifying, ahead of Senna, Alboreto, Prost and Nelson Piquet. The weather was hot, and after making an excellent start, double world champion Piquet made the most of his BMW engine's superior power (this engine was the most powerful in F1 at the time) and Pirelli tires that for once, seemed to work properly. After making an excellent start that propelled him to 3rd, Piquet passed Senna on the Mistral Straight, and then he passed the leader Rosberg on Lap 11. Senna went into the pits and fell down the order; while driving hard to make up places he crashed massively at the very fast Signes corner after the Mistral Straight after the Renault engine in his Lotus failed and dropped oil on the rear tires, causing him to spin off while turning into the right hand corner. Rosberg had wrecked his tires early on, and was harried by Prost and his teammate, defending champion Niki Lauda. After a long battle where Rosberg held up the two McLarens and allowed Piquet to get away, Lauda went out with gearbox failure (the Austrian so far had only finished once this season), Prost eventually took Rosberg, who went into the pits to have his tires changed. Rosberg stormed after Prost, who was putting considerable pressure on Piquet. The Finn eventually passed the French Prost for 2nd, behind Piquet. During qualifying, the turbocharged Brabham-BMW of Marc Surer reached a season fastest 338 km/h (210 mph) on the Mistral Straight. This compared to the fastest (and only) non-turbo car, the Tyrrell-Ford V8 of Stefan Bellof who was recorded at 277 km/h (172 mph). F1 went to England for the British Grand Prix, this year being held at Silverstone, which was the fastest Grand Prix circuit in the world at the time. Rosberg outlined this by averaging 160.9 mph in qualifying – more than 7 mph faster than the pole time set for the 1983 British GP. The race was, as expected, very fast – Senna, after starting 4th, took the lead at the start after an excellent start. He led for most of the race distance – after Rosberg and others fell out with mechanical trouble. Not Prost, however – the Frenchman had dropped back to save fuel, and he then climbed through the field to catch Senna. Prost's McLaren was well suited to fast circuits, and he pressured Senna and the two battled for a while. In an effort to stay in front of Prost, Senna turned the Renault's engine's turbo boost up, and this caused him to run out of fuel and retire from the race; and after that, Prost was never bothered – he had lapped the rest of the field, including Alboreto, who had finished 2nd. In an unfortunate error, the race was flagged at the end of the 65th lap, with the race actually scheduled to run for 66 laps. Jacques Laffite, who finished in 3rd place, actually ran out of fuel on what was supposed to be the last lap, the error ultimately robbing 4th placed Nelson Piquet of a podium finish. The German Grand Prix was held, for the first time since 1976, at the Nürburgring. Although instead of the historic Nordschleife being used, the new GP track was utilized and after Senna and Rosberg fell out while being harried by Alboreto, Prost and Frenchman Jacques Laffite in a Ligier-Renault, Alboreto in his Ferrari took advantage of a rare spin by Prost to take his last ever F1 victory. The extremely fast and scenic Österreichring was the scene for the Austrian Grand Prix, which was dominated by McLaren drivers Prost and Lauda. Prost took pole at an average speed of more than 155 mph (250 km/h). The McLaren car was superior to all the others on this track, and after Lauda fell out with turbo failure, Prost took victory ahead of Senna and Alboreto. Ligier-Renault driver Andrea de Cesaris crashed massively after making a driving error and losing his car at the Texaco bends, and emerged unscathed, thanks to the grassy surface made soft thanks to rain from the night before – but he was fired from the Ligier team after team boss Guy Ligier decided not to keep paying for car rebuilds after the Italian de Cesaris kept crashing Ligier's cars all the time – something the Rome-born had been notorious for during his whole F1 career. The beach-side Circuit Park Zandvoort near Amsterdam was the scene for a very exciting race. After pole-sitter Piquet stalled at the start, Rosberg took the lead, but the McLarens were to show their high-speed circuit superiority once again: after Rosberg retired with engine failure, Prost took the lead, ahead of Senna and Lauda. Lauda eventually passed the Brazilian, and took the lead from Prost while the Frenchman was in the pits. With a car that was not entirely set-up to his liking, Lauda won by a car's length from Prost, who drove very hard to catch the Austrian. This was the triple-world champion's 25th and last ever Grand Prix victory, and it was also the last ever Dutch Grand Prix – the track owners went bankrupt, and most of the Zandvoort circuit's land was sold to redevelopers. The historic Italian Grand Prix at the very fast Autodromo Nazionale Monza saw Williams-Honda driver Rosberg dominate the race, but he went out with engine failure, and Prost took victory, ahead of Brazilians Piquet and pole-sitter Senna. The rescheduled Belgian Grand Prix returned to the Circuit de Spa-Francorchamps, a track relished by drivers, even in the wet. Niki Lauda crashed his McLaren in practice, and injured his wrist; he would not take part in this weekend or the upcoming European GP. This race was a rarity in that it was a wet-dry race: Prost took pole ahead of Senna, but Senna took an immediate lead into La Source, ahead of Piquet and Prost. Piquet then spun, and Senna started to break away. After most of the drivers changed onto slick tires after the conditions were found to be too dry for wet tires, Senna led most of the race, but was challenged by Nigel Mansell most of the way. Senna won his 2nd GP from Mansell and Prost. Prost, the championship leader, now had a firm lead over his closest challenger Alboreto – if Prost gained more points in the next race, he would be Drivers' Champion. The European Grand Prix was a filler race – Grands Prix in New York City and Rome did not materialize and were cancelled; this race came 3 weeks after the Belgian event. This race was held at the fast southern English Brands Hatch circuit, normally used for the British Grand Prix on even numbered years. This race was a very exciting one: Senna took his 6th pole position at an average speed of more than 140 mph (228 km/h). There had been some concerns about racing these very powerful cars at the small, very fast Brands Hatch circuit: Niki Lauda and a few other drivers felt the cars were too fast for a short circuit like Brands, and if the power of the engines increased over time, the circuit would have to be modified in order to accommodate the cars. Senna led from pole position and was harried by Rosberg. Going into Surtees Rosberg tried to get past Senna, but Senna took his line forcefully and Rosberg spun to avoid contact. Piquet hit Rosberg and retired, but Rosberg was able to get to the pits and returned to the track right in front of Senna who was then being harried by Mansell. Rosberg then held Senna up whilst going into Surtees, which enabled Mansell to overtake into the lead. Mansell led the rest of the race distance, while Marc Surer in a Brabham-BMW got up to 2nd, but retired at Stirling's corner after a fire broke out on the back of his car. Meanwhile, Alboreto's car failed and caught fire; he drove it back to the Ferrari pit while up in flames, in an effort to get the message across to his team about his car's most recent unreliability that cost him the championship. Prost, however, made a very bad start, dropped to 15th and finished in 4th, which was enough for him to become world Drivers' Champion for the first time. He finished behind Mansell, Senna, and Rosberg, who drove a storming race to finish 3rd. The South African Grand Prix, held at the very fast Kyalami circuit had been a point of contention all throughout the year: South Africa, ruled by a racial segregation regime, had declared a state of emergency and controversy ensued throughout the year whether this race would take place or not. Governing body president Jean-Marie Balestre announced that the race would take place despite opposition from Renault and Ligier teams, who pulled out due to pressure from the French government. With only 20 cars starting, the race was an exciting one – Nigel Mansell took pole at an average speed of 147 mph (235 km/h). Rosberg took the lead, but then went off on some oil at Crowthorne which had been dropped by Italian Piercarlo Ghinzani's Toleman, whose Hart engine had failed. Mansell took the lead from the Finn – a lead which he was to keep to the end. Rosberg drove hard and caught 2nd-placed Prost before the finish, who ran out of fuel – but was still classified 3rd to make it a Williams 1–2; Williams was the third team this year to finish a race 1–2, the others being Ferrari and McLaren. A few days after the race, it was announced that the South African GP was struck off the calendar for 1986, and this would be the last South African GP until 1992, which was won again by Mansell in a Williams-Renault. The first ever world championship Australian Grand Prix was held on a street circuit in the city of Adelaide. The race proved to be popular – and Senna took his 7th pole position of the season by some margin on his superior-handling Lotus-Renault. He, however, ran into difficulties – after missing the pit entrance twice, he eventually got his tires changed, and drove very hard to catch leader Niki Lauda, who had taken the lead from Rosberg. Lauda and Senna battled hard, and Senna eventually pulled away from Lauda – who crashed on the main straight in what was his last ever Grand Prix. Senna, however, retired with a very badly misfiring engine, and Rosberg took the lead and won, ahead of the two Ligier drivers Jacques Laffite and Phillippe Streiff, whom both crashed into each other on the main straight on the last lap. The Belgian Grand Prix was originally to be run on June 2 but was rescheduled to September 15 after the then newly laid surface had badly broken up. A final attempt to put on a Grand Prix in New York City was scheduled for September after the Italian Grand Prix, but this race was cancelled. A third Italian Grand Prix in Rome was also scheduled for October 13, but it too was cancelled. The European and the rescheduled Belgian Grands Prix replaced these events. Championship points were awarded on a 9–6–4–3–2–1 basis for the first six positions at each race. The best eleven results could be retained. Only drivers who scored points were classified by the FIA in the final championship results. Championship points were awarded on a 9–6–4–3–2–1 basis for the first six positions at each race. Only manufacturers that scored points were classified by the FIA in the final championship results. ^ "F1 1985 FIA Review 16 Adelaide End Credits"
^ Official results for the 1985 Formula 1 World Championship for Manufacturers as published in the 1986 FIA Yearbook, Red Section, Results of 1985 FIA International Championships, pages 78–79, listed the ten manufacturers as McLaren, Ferrari, Williams, JPS, Brabham, Ligier, Renault, Arrows, Tyrrell Ford and Tyrrell Renault.